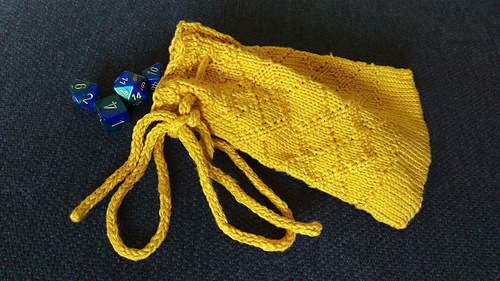 Nicely sized drawstring bag with a texture argyle pattern which will hold a lot of dice, or a small knitting or crochet project (you will need a fabric lining if you want to keep needles or hooks from poking out). 2 needles of a set of 3 mm/US 2 1/2 DPNs for making icord. Gauge is not crucial here, but it will affect the size of the bag and the yardage needed.